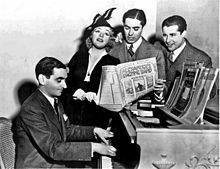 Join us for an evening reception with open bar and appetizers, followed by a lecture on the life and work of Jazz Age composer Irving Berlin. The open bar will include a selection of wines, beers, sodas, juices, and mineral waters. Appetizers will include an assortment of cheeses, dried fruit, grapes, berries, assorted crackers, casalingo sausage, sliced prosciutto, cornichons, and sliced baguette. Dr. Robert Jenner is a local historian and speaker who lectures on a variety of historical and current event topics. Dr. Jenner will speak (and sing) his way through Irving Berlin's life and music (with help from the audience). Mr. Berlin is one of the iconic American composers of the Art Deco era and his works include hits like "Puttin' on the Ritz", "Blue Skies", and "Let's Face the Music and Dance" and he was instrumental in launching the careers of Fred Astaire and Ginger Rogers. Berlin also wrote "God Bless America" introduced by Washington native Kate Smith. Some saw Dr. Jenner's program at the World Congress on Art Deco in Cleveland this past spring. It was such a big hit with the crowd that we wanted to share it here in Washington. The Arts Club is a new venue for the Art Deco Society. 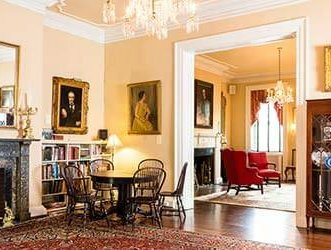 It is housed in the historic landmark home of President James Monroe on I Street in downtown DC. This inviting venue features the original interiors and a warm, comfortable club-like atmosphere with wonderful art work. We think it's the perfect place to kick off the holiday season. For those driving, there is some on street parking in the neighborhood and there are several parking garages nearby, the one at 20th & Pennsylvania Avenue being the closest. Attire: As always, vintage clothing is most welcome, but not required!